My bracelets often inspire empowering conversations; The conversations often end, with me giving the other participant the bracelet off my wrist. The bracelets include my words of inspiration for today’s youth : “Never let anyone define who they want you to be. You know who you are”. And now I also have matching rings in bright neon colors. 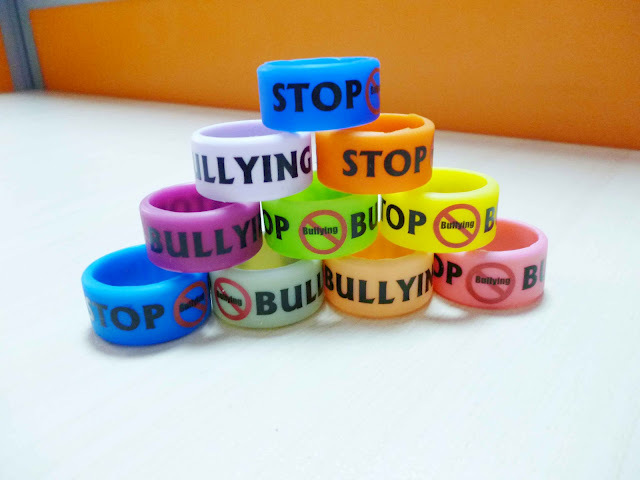 The rings too help support anti-bullying and lead to empowering discussions. It’s not always so easy but it’s important, so important to find that fit inside you; to find what you believe in, what excites you and what you like to do. Be a change maker for yourself and you just may Rise Above in your own personal – or even global world! In 2012, Silberkleit created Rise Above Social Issues Foundation INC. to address challenging issues such as bullying, obesity, literacy. The Foundation is developing a series of educational comic books that focus on these issues and encourage literacy and confidence so that youth can become positive influences on their peers. She shares her words of inspiration with today’s youth. Her bracelets and rings will be available for sale the Foundation website.